Dated design & decor, but rooms were very spacious. Very nice rooms, and clean. Everyone was really freindly. Where to find Bay City hotels near an airport? Where can I find hotels in Bay City that are near tourist attractions? 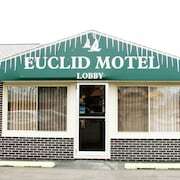 As there's 13 Expedia places to stay in Bay City, travelers here are spoilt for choice. Within a convenient 0.1-kilometre (0.06-mile) radius of Bay City's town center you can select from 13 Expedia-listed places to stay. 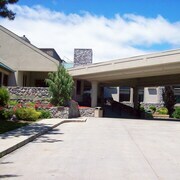 Some of the more central hotels of downtown Bay City are the DoubleTree by Hilton Hotel Bay City - Riverfront and Bay City Inn. 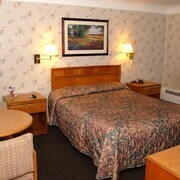 7 kilometres (4 miles) away from the heart of Bay City is the Econo Lodge. This is a a smart option for tourists on a budget. Travelers could also have a look at the Bay Motel. You could investigate the Fairfield Inn by Marriott Frankenmuth and the Hampton Inn & Suites Saginaw. 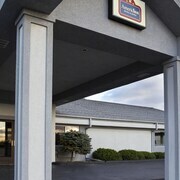 The Fairfield Inn by Marriott Frankenmuth is positioned 30 kilometres (20 miles) away from downtown Bay City. 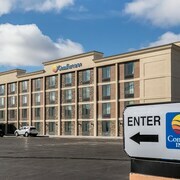 The Hampton Inn & Suites Saginaw, is located 15 kilometres (9 miles) away. 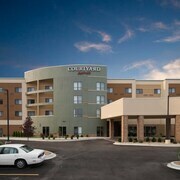 Some other options are the Holiday Inn Express Hotel & Suites Bay City and the Residence Inn by Marriott Saginaw. For those who'd like to see more of the rural landscapes and lakes in this section of United States of America, you may like to plan to spend time in other parts of Saginaw Bay. Whether you engage in common regional activities, such as hiking, or simply travel around to explore the area's offerings you will be able to reserve comfortable accommodation in the area. 20 kilometres (13 miles) away from Bay City you'll find Celebration Square, where you'll find Andersen Enrichment Center and Children's Zoo at Celebration Square. 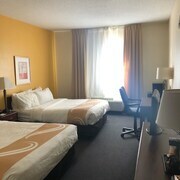 If you'd like to spend a night or two in Celebration Square, check out the room rates at the Montague Inn and Ramada Saginaw Hotel and Suites. 40 kilometres (25 miles) to the south of Bay City, you can also stay at Birch Run, home to the Holiday Inn Express Birch Run - Frankenmuth Area and Comfort Inn Birch Run - Frankenmuth. The Birch Run Expo Center and Birch Run Premium Outlets are a couple of the more popular sites to see for those visiting Birch Run. Before you head off to Bay City, make sure you look through our Bay City travel guide where you can get the low-down on the extensive scenic and cultural attractions this fascinating destination offers. What are the most popular Bay City hotels? Are there hotels in other cities near Bay City? 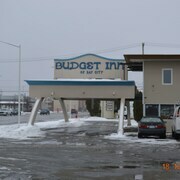 What other types of accommodations are available in Bay City? Explore Bay City with Expedia.ca’s Travel Guides to find the best flights, cars, holiday packages and more!